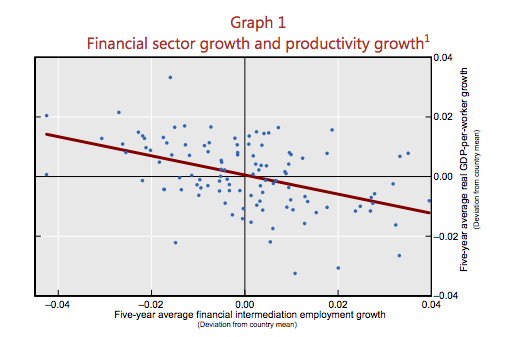 sector growth crowd out real economic growth?, its analysis of why too much finance is a bad thing is robust and compelling. This article is a follow up to a 2012 paper by the same authors, Stephen Cecchetti and Enisse Kharroubi, which found that when finance sectors exceeded a certain size, specifically when private sector debt topped 100% of GDP or when financial services industry professions were more than 3.9% of the work force, it became a drag on growth. Notice that this finding alone is damning as far as policy in the US is concerned, where cheaper debt, deregulation, more access to financial markets, and “financial deepening” are all seen as virtuous. This entry was posted in Banking industry, Credit markets, Derivatives, Economic fundamentals, Federal Reserve, Market inefficiencies, Real estate, Regulations and regulators on February 19, 2015 by Yves Smith. Wait, you mean people shouldn’t seek out ways to maximize their own gain at the expense of society? This sounds like people are supposed to have morals or somethin’. As a software programmer (not in finance), I know several programmers who are working in financial companies such as banks, but who are getting paid to develop cool and useful software that they are then allowed to release as free/open source code that benefits the public (or at least the wider nerd community). That slightly mitigates the brain drain, though of course it’s tiny versus the overall scope of the problem. Sergey Aleynikov, formerly of Goldman Sachs, might differ with your creative vision of the future. He brought his lifetime toolbox of code solutions to their job, but then he tried to leave with his toolbox. The frame he then occupied said “Thief” and did more time and pain than the “tan man” or his beaucoup brethren in moral hazardry. Once again economics shows how its best work is really stating the bleeding obvious! Was there any discussion of solutions? Yes. Even the most obvious economic truth is held in contempt until it bears the imprimatur of an academic economist. Thanks for highlighting these papers. Seems obvious that devoting more resources to bean-counting and bean-rearranging and bean-repackaging rather than producing beans and finding new and better ways of doing so would hurt growth and innovation in the part of the economy that matters most: meeting real needs with real resources. Also, think of all the resources wasted during buyouts and bankruptcies and restructurings driven by the financial sector. Economists should investigate the virtues of stability. The well-oiled firm that produces quality goods over decades at a small, sustainable profit probably serves society much better than the shooting star start-up or the bought-out, outsourced, asset-stripped firm that feeds the private equity vampires. So, instead of innovative and marketable goods & services, we’re simply selling ever-escalating bad debt? You’re obviously a Communist terrorist, right? Restating the “bleeding obvious:” The profits of finance are overhead costs to producers and consumers. They are, technically, parasitic. They take from everything and give nothing but additional cost and higher prices in return. They are a tool used to impose tyranny on a population. To reduce the damage done by finance to a minimum, all of it must be non profit! Tax the [for profit] banks and billionaires until until they’re no longer . . . a threat to our survival.